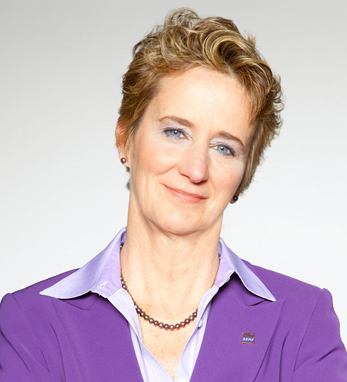 Mary Kay Henry is president of the two million-member Service Employees International Union (SEIU), and her leadership is rooted in a deep-seated belief that when individuals join together they can make the impossible possible. Under her leadership, SEIU has won major victories to improve working families’ lives by strengthening and uniting healthcare, property services, and public sector workers with other working people across the United States, Canada, and Puerto Rico. More than 10 million Americans will see their wages go up to $15 an hour, and more than 18 million have won raises, since the Fight for $15 began four years ago. Under Henry’s leadership, SEIU is fighting for justice on all fronts, and she believes that the movements for economic, racial, immigrant, and environmental justice are interconnected. Born in Detroit, Michigan as one of ten children, Mary Kay’s ancestors are from Tipperary.